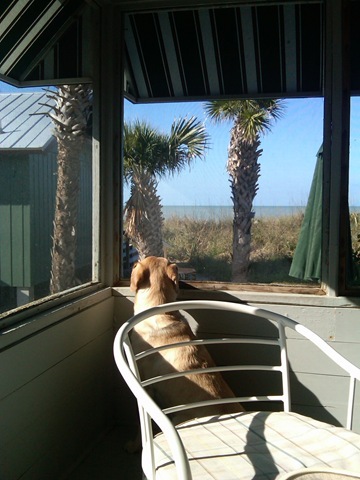 Here is guide dog Nira enjoying the view at The Hermitage in Sarasota, Florida. Her partner is really writing. But let’s be serious, until his recent eye operation he couldn’t have taken a photo of anything, let alone a lovely Labrador scenting the winds off the ocean. Nira will be sending her own posts of course. Right now she’s smelling a heron’s wings. Now I’m off to buy dog food for the girl pictured above. Hey, I just checked out The Hermitage website. This is a mighty fine gig! You’ll have equal opportunity for solitude, work and further explorations into the fine art of conversation. Wowie-zowie, good stuff!